The Google Calculator is a pretty simple calculator, but it's nicely designed and easy to use. You can add, subtract, multiply, and divide (of course), but there are also basic trigonometric, logarithmic, and exponential functions. It even has an Android Wear version. As stated previously, it comes preloaded with all Google phones and tablets, and even other phones like my Moto G5S Plus, but it can be installed on virtually any Android device. I often install it on Samsung and LG devices I use just because I like the look better than those OEMs' own calculator apps. In case you were wondering, it's hard to pinpoint any sales figures from this. Not only is the app available to all for download, but it also comes preloaded on devices from other manufacturers. All we can say for sure is that this means Google has sold fewer than 100 million devices since March 2016, when the app was uploaded to the Play Store for easier updates, but that's not much of a statistic. 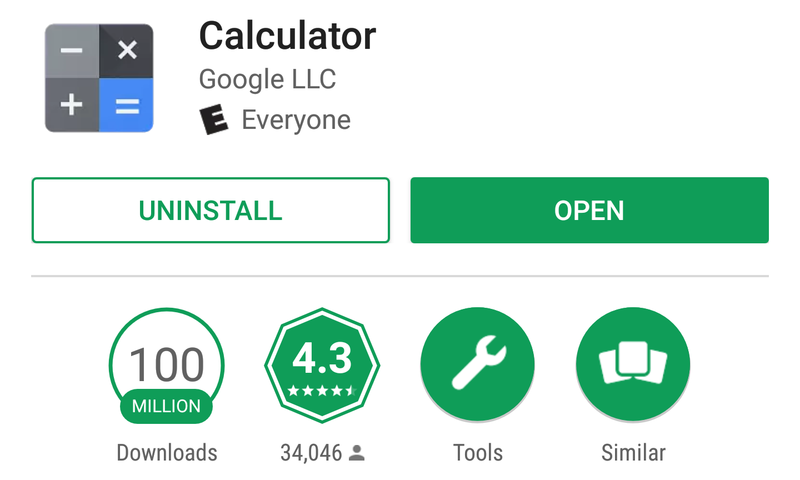 Even that isn't necessarily accurate, as Google devices that came before Calculator was uploaded to the Play Store would have downloads counted when they began to use the Play Store for updates. You can check out Google's Calculator via the widget below.